Mt. Waterman - San Gabriel Mountains - Beyond Limits on Foot! To get to the trailhead: Take 210 freeway and head northeast on Angeles Crest Highway (CA 2) for 35 miles. Find a small parking area on the North side of the highway just past mile marker 58. If you hit the entrance for Buckhorn Campground you have gone too far. Hang the adventure pass on your rear-view mirror. Directly across the road is Waterman Trail. It was Saturday, July 13th, and well why not go up to the mountains and “take a hike”. 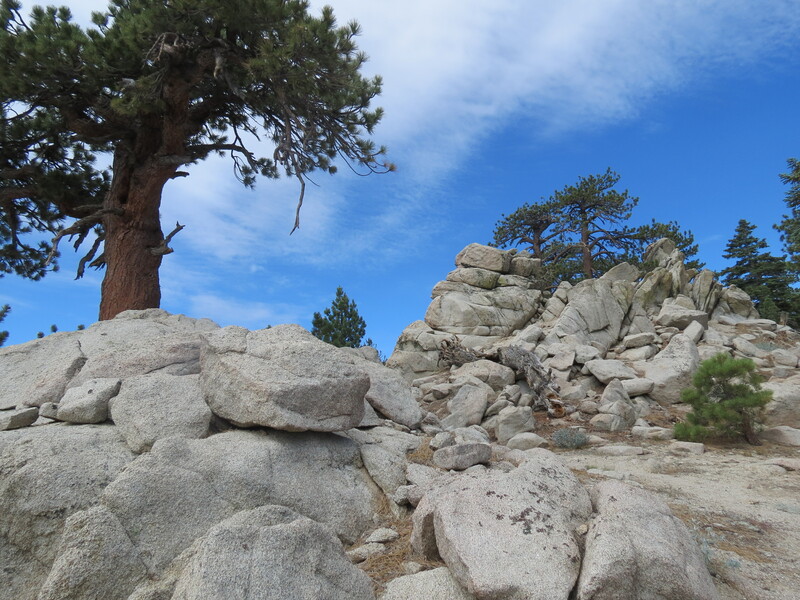 That’s just what we did, we went to the San Gabriel Mountains this time, which is a short drive away from Pasadena. If you live in that area, it’s very easy to access many hikes up in this are off the Angeles Crest Highway (2). After about a one and half hour drive and picking up a $5.00 National Forest Adventure Pass (required) at a local biker’s bar/cafe (which was full with not a woman in sight) we parked and headed up to Mt. Waterman at 9:15 am. Trailhead: approximately 6,700 feet. It was a gradual ascend up 3 miles, with 4 or 5 switchbacks. We hit only 2 people on the trail; surprising for how beautiful it was outside. Almost every switchback we had a different view of the Forest, where we obviously had to stop to snap a few photos. The drive up was definitely dry and you could see remains of fires, but on this trail, that was NOWHERE to be seen. It was scenic (green, flowers blooming and birds all around). In this area incense cedars and Jeffrey pines are very common. Within an hour we got to the summit, which sits at 8,038 feet. The last stretch up to the summit was the hardest, but it wasn’t too long and without a 40 pound backpack, well you can say it was pretty easy. At this point there a few rock piles you could climb up on just to get 360 degree view of the surrounding area. That’s just what we did and decided to snack at the top of one of these piles. After the snack we headed back down the mountain. Best park about a “summit” hike is the downhill portion. Not that this was an unbearable hike, but there’s always that accomplished feeling on your way down. Then you actually see how much uphill you did as well. The entire hike without our snack-time took us a little less than 2 hours. I do recommend taking stuff for a picnic and hanging out at the top. Note to self: Next time take the longer route to Twin Peaks, would have been 12 miles.